Rental 5 — Automotive Restorations, Inc.
After a complete nut-and-bolt restorations and build, our Spec Miata race car ready to meet you on track. This highly competitive, fully compliant Spec Miata is perfect both the veteran racers looking to have some fun and inexperienced drivers alike. Spec Miata is a class well known for being competitive, welcoming to all drivers and, most importantly, endlessly fun. The Miata has earned its reputation for being a spectacularly balance and capable car, and has become a darling of the motor sports world thanks to its low curb weight and excellent driving dynamics. 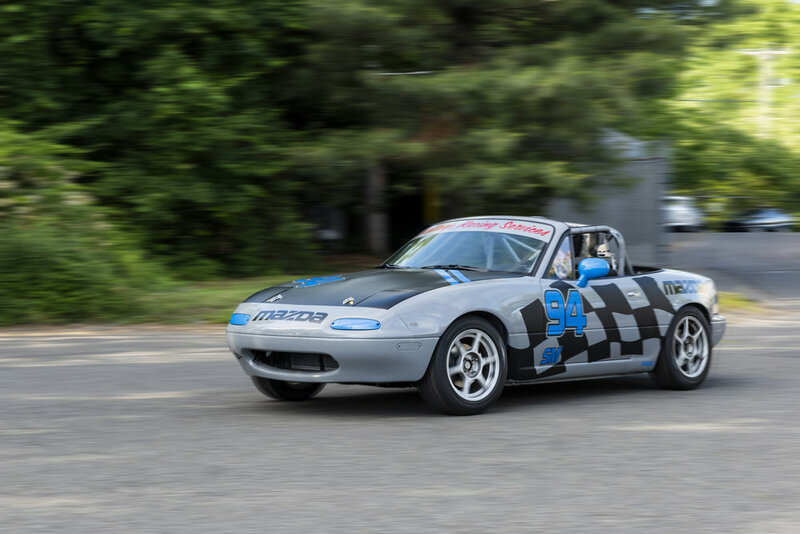 Our Miata was built with inexperienced drivers in mind, allowing them to jump into racing with a fun, manageable, lightweight car that will allow them to test their own limits. For more experienced drivers, Spec Miata other SVRA classes in which this car is eligible feel like the British lightweight classes that we all love. Driver skills is the true advantage in these classes, and allow motor sports veterans to hone their skills in a highly competitive environment.